Serenely located on a stunning plateau above the dry Almanzora River valley, the unique Desert Springs resort enjoys some 320 days of annual sunshine, offering an outstanding holiday at any time of the year. Serenely located on a stunning plateau above the dry Almanzora River valley, this unique desert resort enjoys some 320 days of annual sunshine, offering an outstanding holiday or golfing experience at any time of the year. The resort’s rustic red and warm ochre tones, surrounded by palms and cacti, sit beautifully within a rugged wild west landscape reminiscent of Arizona or New Mexico, with a range of accommodation to suit all needs. You’ll find colourful markets nearby at the traditional Spanish fishing village of Villaricos and at the precariously perched hilltop town of Mojacar, while a variety of beaches stretching 20 kilometres along the coast offer everything from buzzing beach bars to peaceful seclusion. 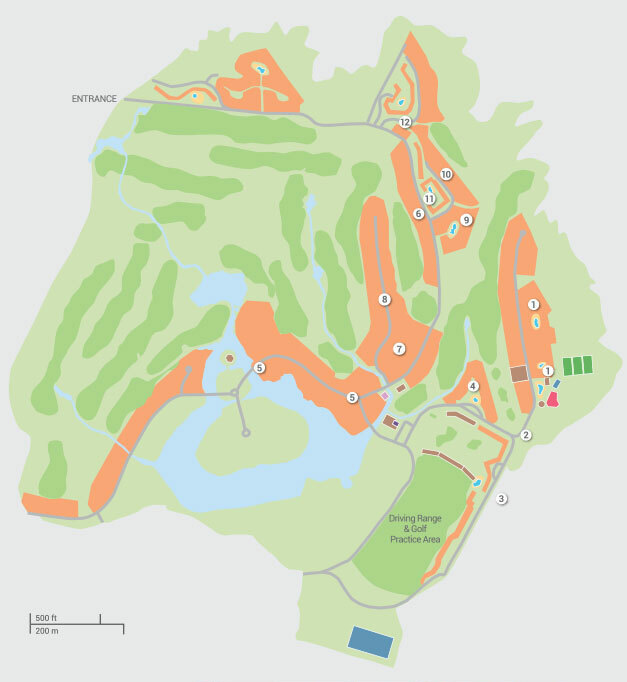 Besides the strikingly beautiful golf course, there’s a fantastic array of family-friendly facilities here with activities to cater for all tastes and age groups. Whether you are a serious golfer or just starting out, teaching the kids or playing just for fun, the 72 par international championship Indiana golf course provides a test for all levels. Inspired by the top quality desert courses of Arizona, it features bright green fairways which contrast vibrantly with the surrounding arid landscape of cactus, rock and flowering desert. So if you do end up in the rough, at least it will be in visually stunning surroundings! Dress code Golfing attire and golf shoes are required. The Desert Springs Tennis Academy is great for all ages and abilities. Groups and teams are most welcome! The Tennis Academy has two tennis courts, two padel courts and a beach volley court, The tennis and paddle courts have top quality, 'Cushion Life' surfaces that give high bounce and add to the ease and pleasure of the game. Tennis lessons from a qualified tennis instructor are available upon request. Approximately €6 per hour court hire for a tennis court and approximately €9 for a paddle court. There is an additional €2.50 for racket hire. Located beside the Crocodile Club, the Sierra Sports and Fitness Club is equipped with state-of-the-art equipment from Star Trac, including treadmills, steppers, rowers, resistance equipment and weights, with plenty of space for floor work. Light and airy, this is a relaxed and pleasant gymnasium to tone up; the whole front opens up to take advantage of the warm dry climate. There is a fee of approximately €5.10 per person for single entry to the gym. A monthly pass is available at 35 Euros. For those, who prefer to exercise in complete privacy, there is also the equipped Private Individual Work Out Area in the Private Reserve facilities. There is a charge of approximately €20 per hour to use the gym facilities. There is a fee of approximately €5.10 per person for single entry to the gym. Two spectacular Jogging Track Loops of 1.6 and 2.2 km are available through the landscaped areas of the Resort. Take yourself on a spectacular self-guided bike tour. Ride through to Cuevas del Almanzora, Vera, Garrucha, Mojácar or Turre for an unforgettable, unique sightseeing experience. With hundreds of kilometers of tracks through wild countryside, mountain trails and quiet rural roads, both flat, hilly and some excruciantingly steep, there are rides to suit everyone, from beginners to veterans! Desert Springs has 22 quality sturdy Ventura Mondraker Mountain Bikes available for hire. There is a range of different sizes, suitable for use by all the family and each have independent front suspension and disc brakes. Helmet, bike lock and a route map are included. Football & Cricket pitches with changing facilities are also available for hire. The Desert Springs Kids Club has devised a number of fun activities to keep children of all ages actively occupied at the resort’s well-designed Crocodile Club, leaving grown-ups some peaceful time to themselves. This service allows you to escape with the peace of mind that your children are in safe and capable hands. Sessions typically include activities such as the Trim Trail, 5-A side Football, Paddle Tennis, Junior Golf Clinic, Tennis, Basketball, Table Tennis, Beach Volleyball, Drawing, and always finish up in the pool with supervised pool games! There’s an excellent sandy playground complete with slide, wobbly bridge and scrambling net. The family orientated main pool is also found here, an ideal place for children to make new friends. The kids Club might accept older children which is to the discretion of the monitor. Open from 16th July -- 31st August, 5 days a week (Monday-Friday), between 11am - 5:30pm. Pre-booking recommended. Children, age 6 to 12 years, can sign up for anything from a single session of €10 per child, a full day for €28 per child (lunch included), through to a 5-day programme for €112 per child. Pre-booking is required and treatments are by appointment only. The therapist is available after 4 p.m. on weekdays and in the mornings of Saturday and Sunday. The Spa at Desert Springs is located in the Private Reserve, next to the Golf Club House with a therapist offering health and beauty treatments for your pleasure and convenience. A wide range of individual treatments are available and our experienced health and beauty therapist, prescribes and uniquely ensures treatments are tailor made to suit your needs in an un- hurried and relaxed atmosphere leaving you feeling relaxed and revitalised for when you return home from holiday. Include facial creams, stimulating massage and mask with Q10 and Hyaluronic Acid or Vitamin C and Aloe Vera, depending on skin type. Includes therapeutic massage and cervical stretching. Reflexoterapia: Therapeutic massage and refreshing foot cream. Lymphatic drainage: Include hands and leg massages “active circulation”. Physical therapy: This treatment includes therapeutic massage, kinesis tape, electro-stimulation, creams, gels or ant-inflammatory spray. The main pool at Desert Springs can be found at the Crocodile Club, although there are also several other pools throughout the resort on each community (however these are generally only for residents of that community). The villa you are staying in will determine which community pool you will have access to. The large shaped main pool and Jacuzzi are set within natural rock, cascades and planting. The pools are surrounded by cool grass sun bathing lawns, where families and friends can enjoy relaxed semi-private days at leisure, looked after by the friendly pool bar team. Open between: 1st June and 2nd September 2018, 11 am to 6.30 p.m.
Charges are applicable. There is a charge of 5.10 Euros for Lodge guests to use the pool and sun loungers are approx € 1.50 for hire. However, community pools are free of charge to use. Pool towels are available to hire, this is at a cost per person please enquire on resort. Desert Springs has a great selection of places to eat and drink, from the African-themed ‘Croc’ restaurant serving an eclectic menu of burgers, El Torrente restaurant, specialising in fine Spanish dining. A pool snack bar and two informal bars are also available. Please see below for the seasonal opening times. Award-winning food and service to be enjoyed indoors or ‘al fresco’ within the beautifully appointed Clubhouse. Breakfast, Lunch and Dinner menus served and is famous for its delicious Spanish dining including several very special local dishes and fresh fish. Opening hours are 8:00am - 11pm. The clubhouse is also home to The Deck where you can enjoy an early morning coffee, evening cocktails and delicious lunches in a stunning setting. Good food, great drinks, friendly service, fantastic music, a unique setting – The Crocodile Club at Desert Springs. Set on a high point overlooking Desert Springs with views to the sea and the surrounding mountains, the Crocodile Club restaurant is housed in an enormous African style thatched long house. Enjoy balmy summer evenings inside or outside on the terrace or in the semi-secluded terraced garden. On offer are a selection of delectable meat and fish dishes with a twist. You will find influences of Creole, Cajun and TexMex cuisine alongside salads, burgers, pizza and pasta dishes. All to be enjoyed with a glass of chilled wine, an ice-cold beer or any other drink of your fancy. 1st June to the 2nd of September, 7 days a week from 11.00 a.m. to 6 p.m.
Also a range of superb healthy fruit punches of the innocent and more grown up variety, the "El Chiringuito" pool bar is a great place to relax. This is the number one meeting place for an early, and indeed not so early, evening drink on the resort and features a delicious, but dangerous, selection of "croctails”. Come for pre-or after dinner drinks and relax with a glass of chilled wine, an ice-cold beer or any other drink of your fancy and relax to some exotic beats and enjoy the ambience of a truly unique restaurant and bar. The Rosewood bar is open from 1st June to the 12TH of July (Fridays and Saturday only) from 6.30 p.m. to 1 a.m. The 13th of July to the 1st September, 7 days a week, from 6.30 p.m. to 1 a.m. The Cave Bar is an original but refurbished cave which offers extraordinary and exclusive dining facilities and bar in its underground gallery. Book this for special occasions. On site you find a golf-pro shop, which offers a great variety of golf clothing and golf related items. The El Torrente restaurant operates a mini market where you can buy essentials and freshly baked bread in the morning. Alternatively, you can find a fully-equipped supermarket within a 15 minute drive of the resort. The Resort offers luggage storage behind reception and changing rooms in the Clubhouse. It is possible to book a late check-out subject to availability. The late checkout will be until 16.00hrs. Reception storage and changing rooms are free of charge. The late check-out service will cost 30€ (payable locally). It was our first ever villa holiday and now we are wondering why we waited so long. Very quiet location and not a great deal of things to do locally but that suited us. The villa was amazing and we couldn't fault it, the only thing that was extremely disappointing was the fact we booked a villa within a resort so that we could use the included facilities for the children, which included a play area, various restaurants, games room, swimming pool, etc, as advertised clearly on your site, only to find when we arrived none of these facilities were available during October. This meant we struggled to keep the children entertained and spent a fortune visiting places and going on day trips which we didn't plan on doing. I think this needs to be made clear on your website! Extremely disappointed little ones!!! It provided everything we wanted. Particularly like the gated patio as we had an 18 month old toddler. We also liked the choice of eating outside in the open and under the terrace too. We plan to book the same villa for 2019. A modern, well-equipped and comfortable villa with a fantastic outside area. The resort was inviting and well-kept offering a relaxing time. The one issue we experienced with the hot water failing was resolved promptly by James Villa Holidays with regular communication to keep us informed of progress. Only observation compared to other similar accomodatuon we have stayed in would be the lack of basic larder items e.g. salt and pepper, cooking oil etc. However the welcome pack was appropriate. Another great James Villas holiday for us, the second year running. Clean well equipped apartment with excellent air conditioning (lovely weather meant 34 degree heat at times!) and swimming pool on the doorstep. Some holidaymakers complained that the resort was remote, but it didn't matter to us, we had a car and nearest supermarket and restaurants are only 10 mins drive. On site restaurants are quite good but local restaurants are better value especially El Faro close by. Somehow I missed the small print where it states you have to pay 6 euro per person for the crocodile club swimming plus 2 euro each per sunbed there. No problem, we just opted out and stayed with the free pool on our doorstep. They're missing a trick though because we would ordinarily have spent several days at the Croc club, using the restaurant and bar as we went. All in all a great resort well maintained and helpful staff. The location was lovely. The villa itself is also adequate but lacks those special touches you should expect for the money paid. 2 balconies with lovely views - but no furniture which makes them unusable. The booking process and directions supplied were fantastic and the villa and pool were very clean. On the first day we told the site manager that we had a broken patio chair and it was not replaced for our entire stay. There is also no air conditioning in the second bedroom. orpington Family with adult children. Slightly tired villia with worn chairs and outdoor table. Swimming pool generally clean but black marks underneath the lip. Broken tile outside and grass worn even though it was artificial. Expensive golf which was a disappointment. The villa was amazing. Very clean and with everything you could possibly need.